How Can India Beat Pakistan? It’s the million dollar question that a billion people are asking: How can India beat Pakistan? Setting aside the obvious answers such as score more runs and get more wickets, there are some key areas where India can gain an advantage over its fiercest rival. 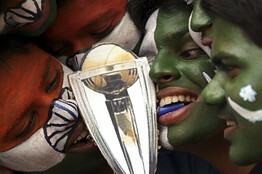 Indian and Pakistani cricket fans with a replica of the Cricket World Cup trophy. Unsettle Shahid Afridi – Pakistan’s captain has been an inspirational presence at this World Cup. He is the tournament’s leading wicket taker, with 21 scalps already to his name, comfortably ahead of the second-top bowler, India’s Zaheer Khan on 17. Afridi oozes charisma but he is prone to tantrums – it’s not uncommon seeing him shouting at teammates when things go wrong in the field, as is all too often the case with Pakistan – so India should try to frustrate him. Afridi is the nerve center of the Pakistan team, and if he is exasperated then negativity will spread to the other players. Nullify Umar Gul – Afridi may have taken the most wickets, but Gul has been Pakistan’s most lethal pace bowler and looks on top of his game with 14 wickets (joint fifth with South Africa’s Imran Tahir in the tournament rankings). Gul has been so important to Pakistan’s campaign, particularly bearing in mind the team was stripped of two key bowling assets – Mohammad Asif and Mohammad Amir – ahead of the World Cup. The track at Mohali should favor pace bowlers over spin (will this mean we’ll see the Rawalpindi Express Shoaib Akhtar? ), so the Pakistanis will be heavily reliant on another good showing from Gul, who has been effective with both the new and the old ball. If India’s excellent batsmen can nullify the ever aggressive Gul, Pakistan’s armory will be significantly weakened. Silence Younis Khan – The big-hitting middle-order batsman has had a relatively quiet World Cup by his standards, scoring 172 runs in six innings, though that includes a 72 against a very fine Sri Lanka. He often saves his best for India so the co-hosts should be on guard if or when he comes to the crease. Out of his six career centuries, three have been made against India, including one at Mohali, the venue for Wednesday’s semifinal. India will do well to keep him contained. Bat to Potential – India has a wonderful batting lineup but there’s a nagging feeling we haven’t seen the best of it at this World Cup. Sachin Tendulkar, Virender Sehwag and Yuvraj Singh are among the tournament’s top 10 run scorers, but India’s other batsmen haven’t consistently backed up the trio’s good work. Captain Mahendra Singh Dhoni hasn’t done much at all with the bat – his top score so far is 34 – though he has often come to the crease when his only option was to have a bit of a slog. All the batsmen in this star-studded lineup will need to play at least one great innings if India is to beat Pakistan and go on to win the World Cup final in Mumbai on April 2. Support Zaheer Khan – India’s bowling was seen as a weakness at the start of this World Cup and it remains a concern. Zaheer Khan has been a revelation but the other pace bowlers need to give him better support. Munaf Patel was targeted by the Australians, particularly Brad Haddin, and it will be interesting to see if India’s coach Gary Kirsten selects him for the semifinal. Shanthakumaran Sreesanth and Ashish Nehra could get a call-up, but both have had their problems this tournament. Left-armer Nehra was hurt in the match against South Africa when he failed to defend 13 runs in the final over, while Sreesanth hasn’t featured since the opening match against Bangladesh when he returned disappointing figures of 0 for 53 from just five overs. Kamran Akmal – It’s harsh to single out the Pakistani wicket-keeper, but he is prone to lapses that make him look like he has smeared his gloves in butter. Akmal put in a much improved performance in the quarterfinal against the West Indies, but India will be hoping he has another bad day at the office and gives the hosts a few reprieves. Ignore the hype – Ok, that’s like telling a skydiver to relax and enjoy the view after his parachute has failed, but India must try to focus on the task at hand and not get carried away by the enormity of this match and the weight of expectation from a billion or so fans. And how can Pakistan beat India? Also, Pakistan needs to silence the home crowd. The stadium in Mohali is small, with capacity for only 27,500 spectators, but they’ll be so loud it’ll seem like there are 10 times that many people. If Pakistan gets some early wickets or an early batting partnership, the home crowd will become restless and that will put India under pressure. Pakistan has the quality and talent to beat the best in the world, but it’s the kind of side that needs momentum and confidence. That will come if the team unsettles India early in the match. Still, hiding Tendulkar’s bat wouldn’t be a bad tactic. And while they’re at it, they should probably take Sehwag’s and Yuvraj’s too. Australia’s 34-match unbeaten run in the Cricket World Cup dating back to 1999 was finally broken by Pakistan on Saturday when Ricky Ponting’s team were beaten by four wickets. Australia, who have won the last three World Cups during the run and were unbeaten in five matches in Group A in this tournament, were skittled out for 176. Pace bowler Brett Lee raised hopes of an Australian fightback when he got rid of opener Mohammad Hafeez in the third over but his haul of four for 28 could not prevent Pakistan from cruising to victory with 54 balls to spare. “We certainly had a tough game today. We didn’t do ourselves any favours. I thought our batting effort was particularly ordinary,” said Ponting, who suffered his first World Cup defeat as captain. Saturday’s result threw the tournament wide open as there is no undefeated team left in the competition heading into next week’s knockout stages. Australia had already qualified for the quarter-finals but will now finish third in the group rather than top, a place now occupied by Pakistan. “It’s a different sort of enjoyment playing against Australia. They may be World Champions but there was no pressure on us so we pulled it off today,” Umar Akmal said after finishing unbeaten on 44. Ponting’s men struggled for momentum through out their innings after opting to bat first. 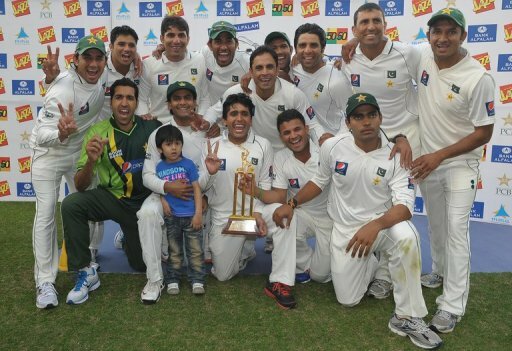 Pakistan’s pace and spin attack, backed up by sharp fielding, never allowed the Australian batting to settle down. A 63-run second wicket stand between Brad Haddin (42) and Ponting (19), who failed once again with the bat, was the only notable partnership in the Australian innings. Michael Clarke (34) and Steve Smith (25) were the only other batsmen to make any worthwhile contributions on a difficult surface that offered spin and some uneven bounce which the Australian batsmen failed to cope with. Paceman Umar Gul (3-30) bowled superbly with both the new and the old ball for the 1992 champions, who were the last team to defeat Australia in a World Cup match in 1999. Gul made the first breakthrough by bowling Shane Watson for nine and returned to clean up the tail by taking the wickets of Jason Krezja and Lee.